HR Consultant at Ahmedabad for placement in India, Africa and Gulf for all Technical & Non-Technical Jobs. The life of India’s second Prime Minister, Lal Bahadur Shastri, holds several lessons in honesty, integrity and simplicity for children and adults alike. Here are some facts and anecdotes from his life that exemplify the principles he lived by. Since he didn’t believe in the caste system, he gave up his surname as a young schoolboy. The title “Shastri” was bestowed on him upon graduating from Kashi Vidyapeeth, as a mark of scholarly achievement. When he married in 1928, at the insistence of his in-laws to accept dowry, he took a charkha (spinning wheel) and some khadi cloth. Even when he passed away, he reportedly had no property in his name and left behind a few books and a dhoti-kurta. As a child, Shastri is known to have swum across the river to reach school to save his impoverished family money to pay for a boat ride. He had many pioneering initiatives to his credit, such as using water jets to disperse crowds instead of a lathi-charge and making it possible for women to be appointed as conductors in public transport facilities. 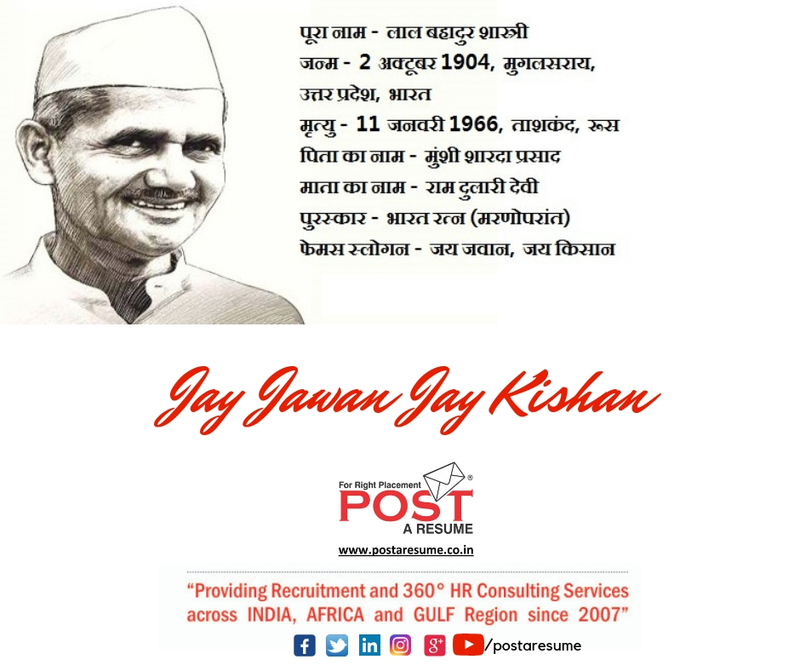 He also raised the slogan of “Jai Jawan, Jai Kisan” during the Indo-Pakistan war in 1965 and paved the way for India’s food self-sufficiency. Since the children were rarely allowed to use the official car to go to school when their father was Prime Minister, the family decided to buy a Fiat car for Rs. 12,000. A bank loan for Rs. 5,000 was taken, which Shastri’s widow had to clear after his sudden death, from his pension. On a visit to a textile mill as Prime Minister, when the owner offered to gift him expensive sarees, Shastri insisted on buying and paying for only those he could afford. He also had an undue promotion for his son overturned. Subscribe for the Job Updates!